Google is a powerful search engine, it is my first choice if I search something. But we also have some other search engines, how can we use them together with Google? Actually, we can use a Firefox/IE extension - Webmynd to customize search result. After you installed this extension, it will ask you some search options. After restart Firefox/IE when you use Google you have two versions: Webmynd version and original Google version. Webmynd version has a very simple interface, almost plain, but you can change page colors. Original Google version almost same original one, but adds some sidebars which from other search sites, like Amazon, Youtube, Wikipedia, and so on that you can add them as you like. 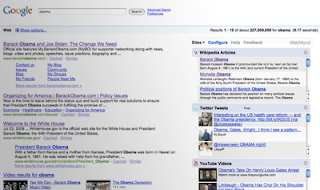 Now, you can search something with some different search engines on one page. That is cool.